The Smart Data Innovation Lab (SDIL) is a German nationwide research initiative from the Work Group 6 of national IT Summit The SDIL has been launched by national politics and IT industry on 8th January, 2014 at the Karlsruhe Institute of Technology (KIT). The goal of the SDIL is to make a in-Memory Big Data infrastructure ready to take on the highest demands on the one hand and data generated in industrial processes on the other. SDIL implements two major goals: First, networking between industry and research organisations which are interested in cooperation in the field of Big and Smart Data. This networking is performed in the Data Innovation Communities (DIC) and Cross Topic Communities. Second, a Smart Data Lab consisting of infrastructure of Big Data technologies, and consulting and Big Data Analytics support for running complex Big Data Analytics. 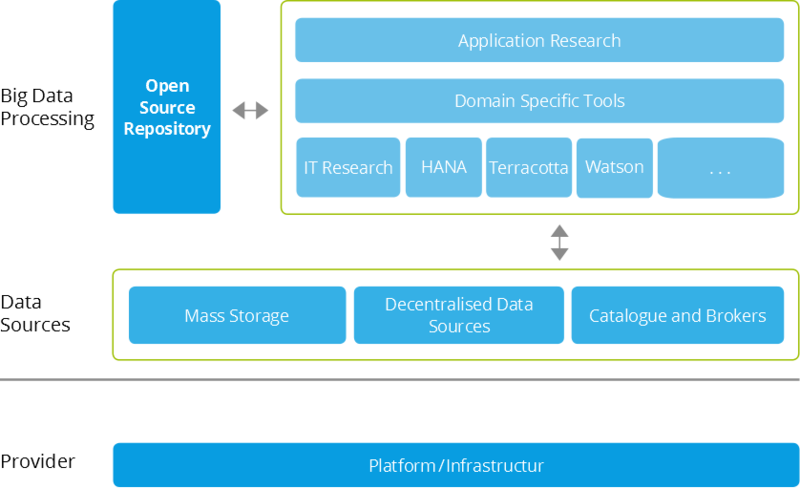 The technical infrastructure is granted to SDIL by IBM (Watson/Power PC), the SAP (HANA, Intel-Server), and Software AG (Terracotta) and operated at the Steinbuch Centre for Computing (SCC). The use of the infrastructure is currently free of charge for SDIL community members, but SDIL expects that community members at some point make data available to the closed SDIL DIC community. Big Data Analytics and Tool Support is provided by TECO. SDIL is headed by Michael Beigl (TECO/KIT) as the spokesperson and Elmar Dorner (SAP) as vice spokesperson. A major outcome of SDIL is to simplify access to and use of Big Data technology and Big data resources, both human (expert) resources as well as technical resources. SDIL provides access to various software platforms (HANA, Terracotta, Watson) and hardware platforms (Intel, PowerPC) in parallel, allowing a user to select the most suitable solution for him or even to compare platforms. SDIL operates with highest security standards: Data analysed by SDIL are stored securely ONLY within KIT in Germany, and requests to access to data have to be explicitly agreed by the data owner always. SDIL also ensures simplified an fast legal procedure by providing standard legal workflows and contract templates already agreed by all SDIL partners. This allows SDIL projects to focus on data and specific outcome to the application domain. Within the adjunct SDI-X project, an open tool framework will be developed for SDIL that will allow users with no knowledge of Big Data and limited knowledge of programming and Data Analytics to run Big Data projects. Running a SDIL project is therefore simple for SDIL members: Step one is “booking” SDIL resources for a project by filing out a template. Then after signing the (template) contracts between the organisations involved (e.g. a company providing the data and interested in analytics, and a University performing the analytics plus the KIT as an operator) and after uploading the data the SDIL infrastructure can be used by the project. Starting the project and running the project is supported by a team at KIT consisting of TECO research group and SCC. This allows SDIL projects to focus on data and specific outcome to the application domain. Experiences of running such a project are reported to the DIC and to the operator to allow them to improve their procedures. SDIL also serve as an infrastructure to analyze smart data technologies potential for SMEs under the program Smart Data Solution Center Baden-Württemberg (SDSC-BW). Please visit www.sdsc-bw.de for more information about SDSC-BW our success stories.